We have a special blog hop planned for you this weekend! We would like to start by announcing the Lindy’s Stamp Gang 2013 Design Team! To celebrate our new team and new color line, Mad Hatter, we’re having a blog hop! It starts today, September 5th 2013 and runs through September 9th, 2013. Up for grabs are THREE gift certificates, each for $50 USD! So hop along, visit all the designers, and be sure to leave them a comment! Pin it for future reference, and feel free to download it as well! Today the ladies will be featuring Mad Hatter. 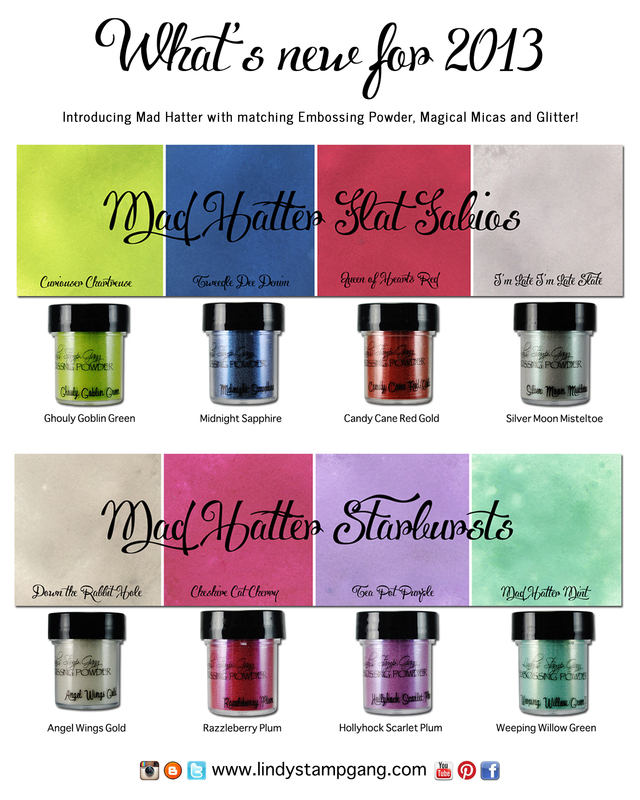 Mad Hatter is available for purchase in Sprays, matching Embossing Powders, Glitters and Magical Micas! When you’re done hopping, come back here and tell us what you’d purchase with a $50 gift certificate! Amazing projects by your design team.Some of them just left me in awe. It was really fun hopping. I would definitely buy the Cheshire Cat Cherry,Curiouser Chartreuse (I fell in love with the two starbursts as I saw your design team use them in their projects so can’t wait to try my hand at it.) and angel wings gold. I would also buy the gelli plate. Keeping my fingers crossed and hoping to win. Awesome blog hop and amazing projects!! The top of my wish list is Limor’s new set coming out on September 17th. I have the Mat Hatter set on order and run to the post office every day looking for it!! Good luck to whoever wins! Fantastic hop. So many gorgeous projects. I’ve been a fan of Lindy’s Stamp Gang projects since stumbling onto Sparkle tart on the web and then doing a class with the amazing Kate Palmer did at a Brisbane craft show. I have a wonderful collection of sprays, so if I won I think maybe I’d invest in some embossing powder or magicals, but then again I’m sure I’d find some must have colours in the new range like that mad hatter mint and gorgeous purple. Thanks a lot for all these inspirations. I think I’m going to try a bit of each product you sell including the news. Thank you for the opportunity to win a prize! I liked sprays and colors!!! Really want to win!!!! Wow, this was such an inspirational blog hop, I loved seeing new projects with this gorgeous new Mad Hatter collection! After seeing the project details, I DEFINITELY need to buy: Curiouser Chartreuse, Mad Hatter Mint, Tweedle Dee Denim, Ghouly Goblin Green emboss, Silver Moon Mistletoe emboss, Sea Foam glitter, and a moon shadow ink green label set! :) :) Thanks so much for the chance to win, and for sharing these beautiful projects and talented new designers with us! Понравились Embossing Powders and Sprays. I love your new Mad Hatter range!! If I won the $50, I would add to my pretty huge Lindy’s stash with the new Mad Hatter Starbursts and Limor’s new Industrial Chic!!! Love them both!! Love all the DT pages! I am eager to try the starburst sprays! Wow $50 lots and lots of sprays. and ladies your creations are awesome. Love all the creations on the blog hop. Love the colours in the Mad Hatter series….just started playing with my sprays in the series. I definitely know what I want to buy if I was lucky enough to win a gift certificate….Industrial Chic and some other colours I have on my list. Such a beautiful and gorgeous line!! This is definitely the line I would buy if I were to win!!! Mad Hatter all the way!! Мне очень нравятся Mad Hatter Embossing Powders and sprays ! very beautiful paints and sprays!!! Already ordered some of them…. I попрыгала all blogs and want to buy a gift certificate…. I’d like to try a new collection!!! Wow, your DT is amazing, all those projects were oustanding! LSG is totally new to me, and I’m a mist addict from way back! О, с большим удовольствием прыгала!))) столько удивительных работ и чудесных воплощений! столько вдохновения и идей!! очень хочу выиграть!!!! Wow!!! What gorgeous and fun projects. So much inspiration. I would stock up on all my favorite sprays if I won. Wow!! What gorgeous and fun projects. So much inspiration. Love the hop, great talent!!! I NEED the Mad Hatter embossing set! NEED I tell you!! Plus, I have my eye on a *few* sprays. I absolutely love the Mad Hatter collection, so it would most definitely be the first thing in my cart if I won. I love seeing all the different ways the products can be used. I would definitely pick up more Magicals! I love the versatility of them. I need more greens, blues, yellows, pinks, purples, browns, oranges. Everything but reds. I’m just not too into that color. I just received my first lindy products and can’t wait to play this w/e. There are so many products I would like to have, but after this blog hop I would definitly use gift certificate for some embossing powder and sprays. Thanks for the chance to win. Love the Flat Fabios … but would definitely pick up the Cheshire Cat Cherry, love that colour! I love the new Mad Hatter color sets. I would get a set of those and replenish some of my sprays. Good Luck everyone. I don’t have many LSG items yet. so would still try the little sets but loving the bright colors of this new Mad Hatter set. Am totally in love with this new line!!! The colors are so beautiful!!! Can’t wait to order them and start using them!!! Thank you so much for the products you offer!!! And, for having an awesome design team!!! what not to buy!? Magical micas would definitely be in my cart. All the colors are so gorgeous! Fantastic new DT!! With $50, I’d definitely buy some (or possibly all) of the new collection, but more importantly I’d save it for when Industrial Chic comes out, I ADORE the preview of that collection!!! I’ve commented everywhere but on Ivett’s blog, her post isn’t up yet – hopefully I’ll have time to come back to it. Besides the Mad Hatter series? I’d start building up my collection of Fabios. They have amazing depth of colour, as good as my derwent inktensse blocks, and far easier to use!!! *sob* your web site is down for maintenance right this moment! Great blog hop. Love all the inspirations. So many ideas, so many ways to use the products, I only have a couple and still trying to learn to use them,so I really love seeing the projects with the use of Lindys products. Besides the mists, I really love those embossing powders. I love the colors of the Mad Hatter series. It appears that it is very versatile as far as subject matter – colors. I would love to have the chance to decide what to get! Thanks so much for a chance to win. I love all the projects of the DT and left some love on all the DT. If I had $50 I would be buy some more sprays until I had them all! Love your products and your sprayers!! Thanks for a chance to win!!! Great blog hop, I enjoyed seeing everyone’s creations! Forgot to tell you what I would order! Def the starburst’s and maybe some Flat Fabios! Loved your blog hop! Thanks so much for inviting me! Wow, your new design team did an awesome job of showcasing your new line. Loved everything. If I won one of the $50.00 certificates I would buy some of your new sprays and embossing powders. Love your products! Had a blast hopping with all the New and Elite designers! If I’m lucky enough to win a certificate I would get the New Mad Hatter Sets of course. This blog hop was just scrumptious…and featured many of my fav ladies! I love the starburst spays, but if I won I would definitely try the embossing powders, the results are just amazing! I also had no idea you guys had chippies? Hello! Maybe a flat fabio? LOL…love everything! Super fun blog hop. The designers are do talented. Thanks for the chance to win! There are some very creative and artsy ladies on this DT. Lots of wonderful ideas and ways to use these fabulous products. Wow what amazing new creations from your uber talented team! I would definitely invest in some mica powders, and maybe a little blue label moon shadow ink! Thanks for the chance! This collection is amazing! So beautiful colors! That was fantastic, each gal offers such a great variety of work :) 50 bucks of Lindy’s!?! Well, I’d have to get my hands on some micas, hands down, flat fabios without a doubt! Then round it out with whatever might be tickling my fancy at the time, probably autumny considering we’re headed that way. You all rock! Just visited everyone’s blog….so much inspiration! I would love some of the Mad Hatter sprays and some of the other wonderful sprays as well! Thanks so much for the giveaway! WOW, so hard to decide – definitely all of the new Mad Hatter embossing powders and mists!! The colors are divine!! Jessica, your cupcake would so go into my kitchen color scheme. Cindy’s tea pot is not only beautiful, it’s brilliant! Is there a styrofoam ball in the pot to kep the shape? Mary, I love the mini. Our grandson is in the Super Heroes stage and what a perfect idea! Your cover really pops with the new Mad Hatter colors, so vibrant! Lynne’s entry was fun. What a great goofy picture! Interesting use of products to create the window, or is it a jukebox? With the picture, I felt like it was meant to be a jukebox. The colors co-ordinate with the uniform so well and nice ribbons on that uniform as well! Lizzy made a terrific box with her entry. Love the “Fairy” with legs dangling, top left, and ribbon wings. Irina’s use of color is wonderful. All of her lay outs were spectacular. Loved the baby coming out of the zipper, so clever. Congrats to everyone on the new DT they all did awesome projects! I think I would need…more of everything…lol…I just cant get enough! Embossing powders especially! I went to Helen’s Blog and where is there a place to leave a comment. I did see something about comments being removed from her blog as she hadn’t rec’d any (Nov. post). I do not understand the business about WORD VERIFICATION. How is this fair? Thank you for selecting me as part of the LSG team! I am already loving promoting your wonderful products!! My order just arrived today and beat the order I placed with another company the same night.. Your service is great. Of course the other order was for paper. LOL Your sprays can’t be beat. Can’t wait to get started. I am anxiously awaiting receiving all the Mad Hatter line in the mail! I am hoping that they get here by the weekend so I can spend it locked in my art room! bahahaha! I would SO get the new Mad Hatter Embossing Powders!!! Those are my faves! The colors in the Mad Hatter series are so vibrant-truly amazing!!! The DT did a wonderful job showcasing the new line!!! Sprays – more more more! I’d have to start with the newest lines (seriously, how could I *not* get Mad Hatter?). Thanks to the DT for all the fabulous inspiration with these wonderful new products! If I hadn’t known it before…I am now more determined to own the Mad Hatter set…will $50 cover most of it??? Lol, amazing work done by the design team to showcase the new products…! Welcome designers, I cannot wait for all the creative inspirations to come. Oh, I already have over 150 sprays, so I think I’d have to add some of the magicals and embossing powders. I’m first)) Very creative DT! I had lots of nice meeting with their works! After hopping through all the blogs, I am impressed with the different styles of this new Lindy’s design team and all the fun uses of the Mad Hatter Collection! A must have for any art arsenal! I’m logged in as coopersbird94 through WordPress on some blogs and through Google as Angel Chambers on others, but I did comment on every blog and can’t wait to see what else everyone does! Thanks for the chance! very pleased to get acquainted! Wonderful work of the girls! Unfortunately, I have not been able to leave a comment with Lynne, is apparently blocking. Thank´s for the nice Blog-Hop! What I´d purchase with the gift certificate? I like EVERYTHING *lol*. But I think, I would take some Embossingpowders and some more Starbursts. I’d purchase some of the new Mad Hatter sprays and Embossing Powders! Fun fun fun!!! This collection is amazing! I visited everyone and was inspired every blog I went too. If I won, I would invest in some magical Micas as I don’t have any yet.